Ghana, officially called the Republic of Ghana, is a sovereign unitary presidential constitutional democracy, located along the Gulf of Guinea and Atlantic Ocean, in the subregion of West Africa. Spanning a land mass of 238,535 km2, Ghana is bordered by the Ivory Coast in the west, Burkina Faso in the north, Togo in the east and the Gulf of Guinea and Atlantic Ocean in the south. The word Ghana means "Warrior King" in the Soninke language. The first stamps of independent Ghana were issued in March 1957 and consisted of a commemorative stamp set of four and a definitive stamp series of 12 formed by overprinting former Gold Coast stamps with the words GHANA INDEPENDENCE 6th MARCH 1957. Regular issues have followed, including a number of sets of postage due stamps. Ghanaian stamps after independence were noted for their bold colours and the frequent incorporation of the Ghanaian flag in their design. Ghana was the first country client of the Inter-Governmental Philatelic Corporation who produced a lot of various stamps on every popular subject on behalf of Ghana, however, inept handling of the early post-independence issues caused damage to Ghana's reputation in the philatelic world from which it has not yet recovered. According to Michel catalogue, until middle of 1960th and 1970th post of Ghana issued no more than 20-40 stamps per year. Later on till today amount of stamps issued every year is rapidly increased. 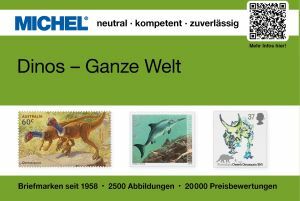 In 1992, the year when first dinosaur stamps issued in the country, almost 140 stamps are printed out. Almost 160 stamps are printed in 1999. The poor country print their stamps with purpose to sale it to stamp collectors rather for real use for the post. 01.06.1992 "Dinosaurs" 08.08.1995 "Dinosaurs" 01.03.1999 "Dinosaurs"
[A1] Portrait of Charles Darwin is on the margin, at top-right side .